Amazon’s Relational Database Service (RDS) is their answer to a hosted, maintained database service. They currently offer several versions of MySQL on their instances, the ability to incrementally backup the databases, and offer full fail-over to another availability zone. Pretty awesome stuff compared to having to manage your own MySQL servers, keep them updated, patched, and manage backing them up. I am writing these instructions because I didn’t find a Ubuntu package to install the RDS Command Line Toolkit for Ubuntu 10.04, and I couldn’t find any clear concise instructions on how to install them, or how to use them. I believe that this is one area in which Amazon fails at miserably. The RDS is a great service, but you have to be a rocket scientist to figure out how to install and use them to use the service to begin with. UPDATE: Scott Moser is working on an Ubuntu package for the RDS tools to go along with the EC2 tools. You can find his work here. The main hurdle in using RDS is that you need to change a database parameter to be able to import a MySQL database from a local server dump to the Amazon RDS server instance that you create. You have to change database instance parameters with the command line tools because you can view, but not change any of the database instance parameters from Amazon’s web based management console. Honesty, this was way harder than it should have been. First, I’ll outline the instructions for installing the RDS command line toolkit, then I’ll supply the parameters that I had to change. Judging from the discussions I found over at the Amazon RDS forum, the need to change some parameters to get RDS to work seems to be a pretty common occurrence. The RDS Command Line Toolkit is available from Amazon’s website here. I downloaded them locally and unzip’d the zip file to a directory called rds. Transfer the unzip’d rds directory to /usr/local/aws/rds on the server using sftp. Add your own credentials into this file. This should be pretty self explanatory. You will notice that there are a few lines that we added or may have already been added that relate to EC2 instead of RDS. This because I had the ec2-api-tools package already installed. If you want to install those tools, you can do them with the following command, but you probably already have them installed. Now that you have the RDS tools installed and your credentials setup, you should “source” your .bashrc file. At this point, you should create a database instance and a database parameter group through Amazon’s Management console. You need to create a second parameter group because you can’t modify the default group. You will also need to give the instance security group access to the RDS database security group through the web management console. The Ubuntu server at EC2 that will be accessing your database on RDS will need to be a member of the instance security group. Once, you have created those two items, you should be able to see them through the command line tools that we just installed. Now that you have the rds command line tools installed and working, you need to change the following parameters in your RDS parameter group. RDS uses latin1_swedish by default, so I needed to change the default for new databases to UTF-8. Additionally, I had some stored procedures in my MySQL databases, and there is no super-user privilege on RDS, so I needed to change the log_bin_trust_function_creators parameter to be able to upload my databases. Last, but not least, my 10 megabyte database wouldn’t upload, so I figured out that I needed to increase the max_allowed_packet value. Please see the commands, parameters, and values below. In this example, my additional database parameter group is called mygroupname. This is where I see Amazon’s failure to make this easy for someone who hasn’t used RDS before. I was only uploading a 10MG database, which isn’t that big. I needed to change at the very least the max_allowed_packets to get my data into RDS. I would assume that this would be a common issue with just about anyone. $ rds-modify-db-parameter-group mygroupname --parameters="name=character_set_server, value=utf8, method=immediate"
$ rds-modify-db-parameter-group mygroupname --parameters="name=collation_server, value=utf8_general_ci, method=immediate"
$ rds-modify-db-parameter-group mygroupname --parameters="name=max_allowed_packet, value=67108864, method=immediate"
$ rds-modify-db-parameter-group mygroupname --parameters="name=log_bin_trust_function_creators, value=1, method=immediate"
Last, you’ll need to reboot your instance to make the parameter group settings take affect. Note that this can take several minutes before you see your RDS instance back online, but it happened pretty quickly for me. Here's some instructions that I found somewhat useful. The last few days I’ve been using my Ubuntu desktop 10.04 more and more, which I’m running as a VirtualBox appliance on my Macbook Pro inside of Mac OS X. Learning the ropes, I’ve stumbled a few times. Luckily, I’ve pretty much figured out how to do everything I needed. I wanted to upgrade from Firefox 3.6.15 which is what was the latest version of Firefox as part of Ubuntu’s Software Center. I had run Update Manager before starting and the latest packaged version was Firefox 3.6.15. 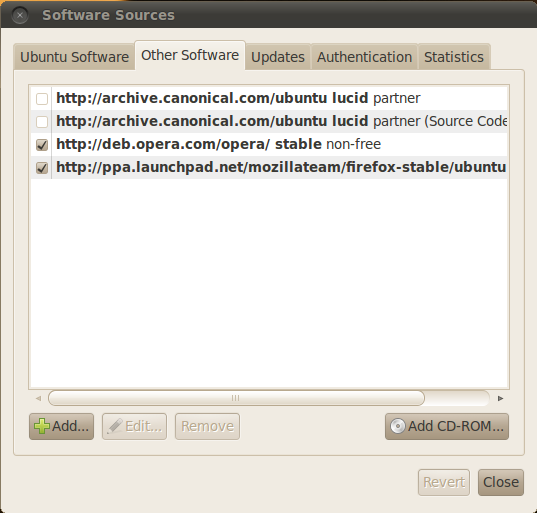 Open up the Ubuntu Software Center then Edit > Software Sources and click the ‘Other Software’ tab. Press ‘Add’ and then paste ppa:mozillateam/firefox-stable into the relevant field. After you click add, you should see the dialog with all of the available software sources as in the diagram below. After adding the PPA you will be prompted to update your sources. Once this completes, you can go to System > Administration > Update Manager to perform an upgrade. I found that a couple of my add-ons were not compatible, but Firefox 4.0 only just came out yesterday, so I’ll give it some time. After setting up my Ubuntu 10.04 desktop through a VirtualBox appliance on my Macbook Pro 15″, I installed a couple of pieces of software through the Ubuntu Software Center which is under the Applications menu item. This consisted of Chromium – Google Chrome browser, VLC player, and Adobe Flash player. I wanted to test out Opera on Ubuntu, but Opera does not appear in the list of available software. I found these instructions on the Ubuntu help site, but wanted to clarify them here. The reason is that I found the instructions at http://deb.opera.com/ to be confusing. Mainly, I didn’t know exactly which apt source I should add. This assumes a fresh install of Ubuntu 10.04 desktop with all software updated – meaning that you have run the following which updates all software, security updates, and patches that have come out since the VirtualBox appliance image or CD/DVD that you used to install Ubuntu was created. This should be the first thing you do on any Ubuntu server or desktop install. NOTE: if you prefer to do things on the command line, the GUI menu item for this stores the sources in /etc/apt/sources.list. So you can manually edit that file to add your new source. Now that you have the source defined and the GPG key installed, you can install the software with these two commands. Now you can go to the menu and start Opera. Note, you can also install Opera by downloading it from another browser like you can with Windows or Mac OS X, and then running the downloaded installer. By installing it through aptitude (sudo apt-get install), it will be upgraded automatically any time there is a newer stable release via Ubuntu’s normal software update mechanism, which by default runs daily. This is the Ubuntu way of doing things. I just noticed that there was a new player in town in the desktop office productivity realm with the name LibreOffice. I was watching a Ubuntu 11 desktop preview video from ZD-Net and noticed that they were referencing the fact that Ubuntu will now come installed with LibreOffice instead of OpenOffice.org. Low and behold after a bit of research, it seems that key developers of OpenOffice.org are not happy with Oracle’s direction for OpenOffice.org and have defected to a new nonprofit organization called the Document Foundation, which maintains LibreOffice. In addition to Windows and Mac versions being available, it appears that other Linux software distributors Novell SUSE, Redhat, and Canonical Ubuntu are backing the Document Foundation and LibreOffice as well. More information here at Infoworld. This certainly creates a dilemma on which version to use. I think I’ll stick with OpenOffice.org for the time being. Has anybody tried LibreOffice yet? What are your thoughts? I have some developers working on a site on a cPanel/WHM CentOS 5 server which has Apache running with the mod_security or mod_sec module running. This is a module that prevents several types of attacks against the server. It is sometimes referred to as an open source intrusion detection and prevention engine for web applications, or web application firewall. To make a long story short, you can place rules in a configuration file, and if those rules are triggered during an HTTP request, the client is refused, usually with an HTTP 406 error.